This is an amazing fantasy story that will draw you in and make you a part of the world of Jaenrye. While I had a little trouble getting into this book at first (due in part to many distractions outside the book), I stuck around long enough to be captivated by the story that was being told. The first thing that grips you about this book is the sheer volume of its cast. The characters themselves, while in large quantity, were not lacking in quality at all. As the words flowed from the pages I could feel the essence of each character as they were diligently described. Beyond the physical, their personalities shone through as if the Dim had never settled over Jaenrye, that is to say they burned brightly! The descriptions of the world were painted as vividly as the characters were. I felt myself seated at the Crown and Staff in the town of Ellerdag talking to Jimbo as he pulled my ale from the tap. I sang with the Bohemians in Falcon's Cay as the bard played for them, and then... well you will have to immerse yourself in the book to find out what happens next, just know that M.J. Heiser is such a crafty writer you will experience every bit of this story right alongside her characters. 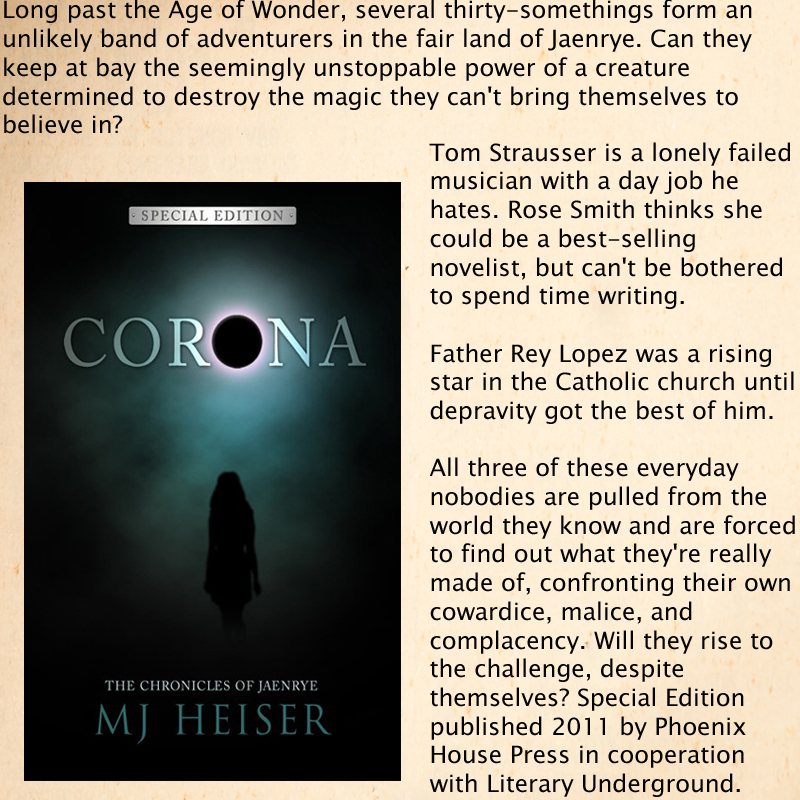 Aside from the interesting characters, Corona touches on creation in a unique way, reminiscent of Cornelia Funke's Inkheart series, but with its own twist. The themes of creation and belief that run throughout this book allow for an in depth look at the vast differences in beliefs that shadow our own world and how those views may affect the characters and their outcomes, thus making this story just as thought provoking as it was entertaining. When you find yourself ready for an adventure, settle down some place quiet and kick back with Corona. M.J. Heiserwill not disappoint you! 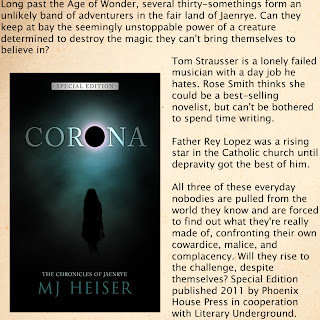 When you reach the last pages of Corona and find yourself saddened that the end has come so fast, be heartened by the fact that more adventures await you with Canticle, the next book in The Chronicles of Jaenrye.